Eating a Mediterranean diet that contains olive oil and nuts can leave you with a healthier heart. In a randomized trial of nearly 7,500 people at risk of heart disease in Spain, researchers discovered that people who stuck to what they called the "Mediterranean diet" — supplemented either with extra virgin olive oil or nuts — had a lower risk of having a "cardiovascular incident" after four years. The best part? These diets were not intended to restrict calories, nor were participants asked to increase their amount of daily exercise. They were just encouraged to maximize healthy food intake. 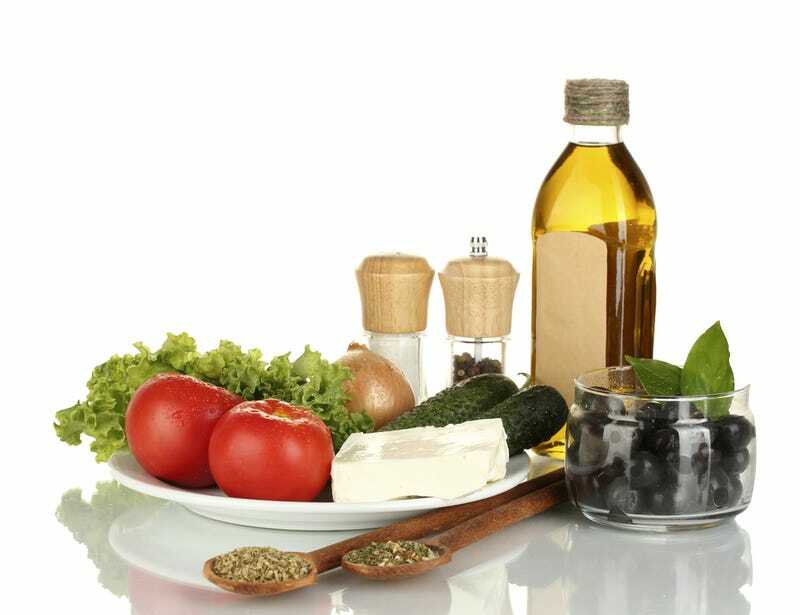 The general guidelines to follow the Mediterranean diet that dietitians provided to participants included the following positive recommendations: a) abundant use of olive oil for cooking and dressing dishes; b) consumption of ≥ 2 daily servings of vegetables (at least one of them as fresh vegetables in a salad), discounting side dishes; c) ≥ 2-3 daily servings of fresh fruits (including natural juices); d) ≥ 3 weekly servings of legumes; e) ≥ 3 weekly servings of fish or seafood (at least one serving of fatty fish); f) ≥ 1 weekly serving of nuts or seeds; g) select white meats (poultry without skin or rabbit) instead of red meats or processed meats (burgers, sausages); h) cook regularly (at least twice a week) with tomato, garlic and onion adding or not other aromatic herbs, and dress vegetables, pasta, rice and other dishes with tomato, garlic and onion adding or not aromatic herbs. This sauce is made by slowly simmering the minced ingredients with abundant olive oil. Negative recommendations are also given to eliminate or limit the consumption of cream, butter, margarine, cold meat, pate, duck, carbonated and/or sugared beverages, pastries, industrial bakery products (such as cakes, donuts, or cookies), industrial desserts (puddings, custard), French fries or potato chips, and out-of-home pre-cooked cakes and sweets. So it's not as simple as eating out at the local falafel joint every day. You have to stick to meals that balance fresh vegetables and low-fat meats with healthy oils and grains. Plus, no french fries or pastries — which seems particularly unfair given that Mediterranean fried potatoes are amazing, as is baklava. Still, it's a fascinating study which reveals that what you eat is perhaps more important than how much you eat. Plus, extra virgin olive oil for the win.